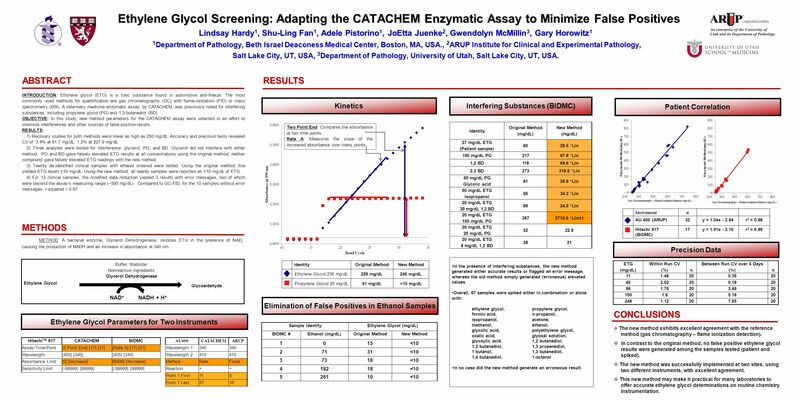 Ethylene Glycol Screening: Adapting the CATACHEM Enzymatic Assay to Minimize False Positives Lindsay Hardy 1, Shu-Ling Fan 1, Adele Pistorino 1, JoEtta. Download ppt "Ethylene Glycol Screening: Adapting the CATACHEM Enzymatic Assay to Minimize False Positives Lindsay Hardy 1, Shu-Ling Fan 1, Adele Pistorino 1, JoEtta." Training Brochure 2012 Industrial Training in Advance Pharmaceutical Science. Analysis of Residues. Laboratory Analysis of Debris and Other Samples 1. Preparation of Liquid Samples: Liquid samples are simply drawn into a special. DRUG TESTING 17 February Vocab Review What is the difference between a presumptive test and a confirmatory test? Presumptive tests have high false. Introduction to ELISA ELISA – short for enzyme- linked immunospecific assay A technique that measures the amount of a specific protein in a solution. Chromatography CHEMISTRY Chromatography Chromatography is a technique for separating species based on physical or chemical properties. Usually. Butanol Production from Clostridia Fermentation David L. Hanson Chem 4101 December 9, 2011. Kyiv, TRAINING WORKSHOP ON PHARMACEUTICAL QUALITY, GOOD MANUFACTURING PRACTICE & BIOEQUIVALENCE Validation of Analytical Methods Used For Bioequivalence. Method Comparison A method comparison is done when: A lab is considering performing an assay they have not performed previously or Performing an assay. Creatinine and the eGFR Graham Jones Department of Chemical Pathology St Vincent’s Hospital, Sydney AACB-AIMS Annual Scientific meeting Hobart 2006. Printed by Prevalence of Heparin in Samples Submitted for Lupus Anticoagulant Testing Nikhil A. Sangle MD FRCPath 1,3, George M.
Dr Saleha Shamsudin. 1.INTRODUCTION Topics to be covered: 1.1 INTRODUCTION TO METHODS IN ANALYTICAL CHEMISTRY 1.2 STEPS IN QUANTITATIVE ANALYSIS.